A couple of months ago, I made a block for Hillary/entropyalwayswins in Bee Sewcial inspired by the notion of how modern quilters are steeped so deeply in tradition, and that led to a very sparse log cabin block. The fact is, I kept thinking about that little block, wanting to recreate it. So when I got a chance to play last weekend, I started in. It felt good, so I kept going. I'm pretty sure my background fabric is an interweave chambray in pepper by Robert Kaufman. All the cabin logs are neutrals - a few cut from yardage, but most pulled from the scrap basket. The majority are solids, but some are favorite low-volume prints. Truly, I made trimming and fabric decisions as I rounded each corner, which was so darn satisfying - pretty much my favorite method of sewing these days. After 3 rounds, I had to let my piece set for a few days as I mulled over where to take it next. I sketched some layout possibilities and finally settled on a pretty basic plan, keeping what I'd already done as the focus. So it's not very big - about 36" square - and now I'm mulling over a pieced backing, hoping to make that process as fun as the front. I'm curious . . . what % of the time do you know where you're going with a project versus the times you figure it out as you go? I've always been a planner, draw it all out on graph paper, color it in with colored pencils, plan plan plan. Improv is challenging me to be more free and open. I'm loving it and hating it at the same time! does that make sense? I usually know what I'm going to do ahead of time but seeing this piece makes me want to try something more unplanned. I really love what you've done here. I would really enjoy seeing your process. 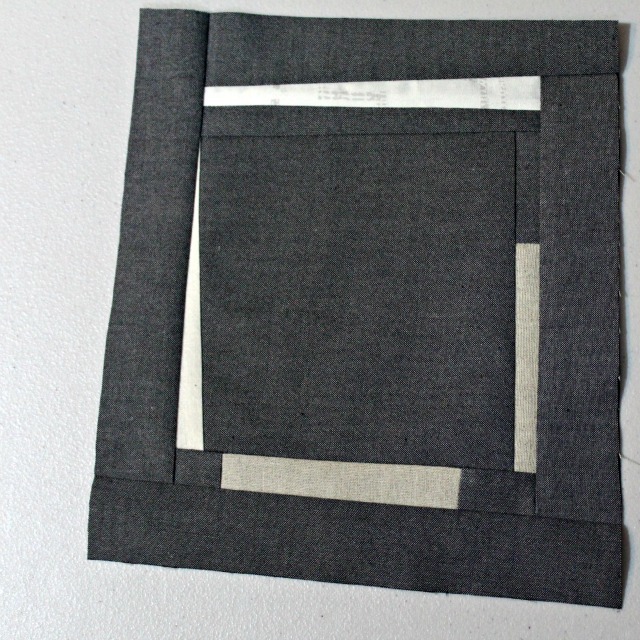 I haven't been quilting that long, just a few years and really want to take the step of making it less structured and not relying on patterns or simple straight line piece as you go. I am a graphic designer by profession, so I think I have a good eye, but really need some direction to do what you have accomplished above. A pattern would be wonderful, but that's not really at all the point, is it? I often go online and look and look for inspiration among the modern quilt world, but, truthfully, your design inspires me more than anything I've seen in some time. I love to just allow the quilt to finish itself. I usually start with a color palette and a general idea but things can change as I go. I love what you did! I plan it all out, but maybe I should embrace the freedom ofnot knowing the destination. I'm totally in love with this little quilt! I'm definitely a figure it out as I go person -- quilting, recipes, whatever -- it's fun that way! I don't have a huge stash so I pretty much know where I'm going when I begin. Plus, I am in the middle of wedding and baby season (nieces, nephews, etc.) so while I am sewing because I love it, I generally have a pool of recipients in mind. This is a winner! I almost never know what will happen while piecing. I often rip things off and start again, sometimes multiple times. And even though I start my journey with some mystery, I seem to always know when to stop! Great mini Debbie. It's you! (I know I've said this before and I still mean it). I really love this one, Debbie. I wish I sewed with such creative freedom--you do such beautiful and interesting work. 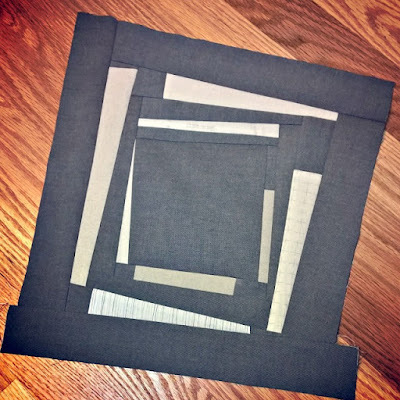 since my very first quilt, I never have a concrete plan! I've only made ONE quilt to date that I followed a pattern...and truthfully, it was because I won the pattern and felt obligated to make it. I usually have a general idea and then start pulling fabrics "eh, I think it will be enough!" I only make quilts big enough for actual use, so minis are out for me, but I always figure someway to manage the finish even if I run out of fabric. I love creating like this! I love your design Debbie! Thank you for a nice idea of how to do this block. Thank you so much Debbie for being such a talented person and sharing you inspiration with us! 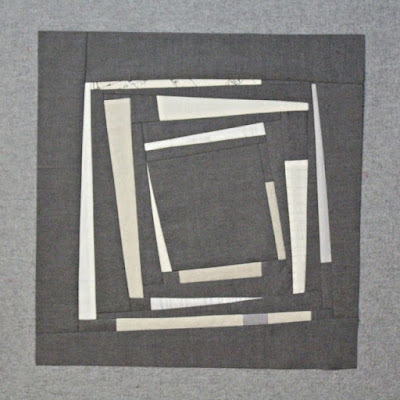 When I first started quilting I always went by a pattern to the absolutely most ridiculous degree. I remember thinking that my sashing strips were somehow wrong because the fabric was black with little flower baskets instead of navy blue with polka dots. I have loosened up somewhat over the years and now rather than deciding on a quilt pattern, I find a block pattern, which I then modify to my liking and then proceed from there. 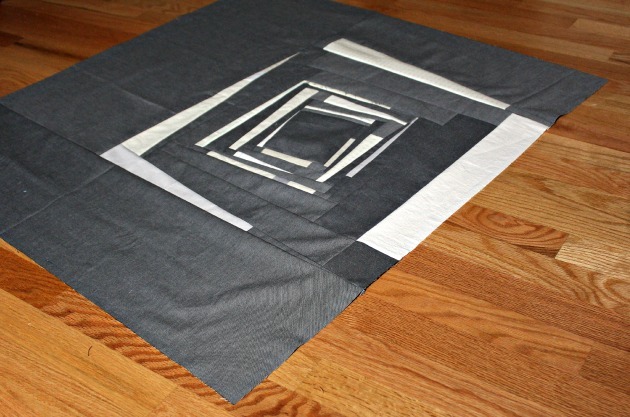 I am I think more of a traditional quilter but I really love looking at modern quilts. Maybe someday!!!! I really love this and it so reminds me of you. I very often have a vague idea in my head and off I go creating the quilt. I loved the original block and the new one...love that too! It's funny how something gets stuck in our head! Most of the time I haven't a clue where I'm going, but love the ride to getting there. The trick is to keep going because you never know how it will turn out! I love where you have taken this Debbie. Such a wonderful theme-modern steeped in tradition and re execution is fantastic. I feel so lucky to have the original (I treasure it and everyone else's block in my possession honestly-little pieces of you all). There is something really freeing and therapeutic in improv quilting and it is done right IMHO with a few set ideas/rules to guide you as you have done. You are fun to watch. I love this mini!!! Will the back have a riot of color? Love your creativity!!! Thanks so much for sharing!!! Amazing! love everything about this one. I have only made 2-3 small wall quilts, where I just go with the flow, but doing it that way for me means it is harder to make my own decisions...following a pattern is much easier, but then it is not my own work.